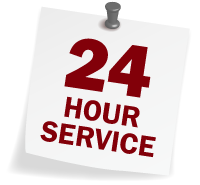 Established in 1971, Bob’s Service Centre provides 24-hour towing services when you need us the most. We enjoy helping people out of bad situations due to unforeseen circumstances involving automobile accidents, lock-outs or whatever other speed bump life throws at you. Being able to make someone smile when they’re obviously having a difficult day motivates our company to provide an outstanding service. Our employees will go out of their way to ensure your complete satisfaction with our many towing and automotive repair services. Providing our towing services throughout Ontario and Quebec, many of our professionally experienced dispatchers are bilingual, offering services to you in both English and French for your convenience. Whether your vehicle needs towed to a specific destination or a battery boost, our experts are on-call 24 hours a day with a fleet of tow trucks and tractor trailers to offer you invaluable assistance. If you’ve accidentally locked your keys inside your vehicle, don’t worry – simply give us a call and we’ll send someone right out to help you unlock your door. We’re also available with float services and our tandem tilt-and-load flatbed trucks to safely transport your heavy equipment and machinery without any damages.